This set of Linear Integrated Circuit Questions and Answers for Freshers focuses on “Operational Amplifier Internal Circuit – 3”. ⇒ VA = Ro×Iref =2.5×2kΩ×2mA =10v. Explanation: Early voltage is assumed to be infinity, so that output resistance tend to infinity and the output current is constant. Explanation: In the widlar current source Re is added to emitter lead of transistor, which consequently results in smaller output current value. ⇒ RE= 0.025/(1+1/β)10mA × ln(12.7A/10mA) = 14/(1+1/β)Ω. Explanation: In current repeater, the current IC = IC1 =IC2 =⋯= IC N≅ Iref . Where, N – Number of transistors used in current repeater circuit. 7. 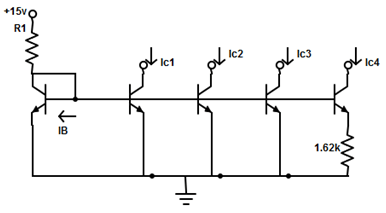 For the current repeater shown in the circuit, determine IC4 value, Where β = 75. Explanation: The reference current, Iref = VCC-VBE/R1 =(15v-0.7v)/39kΩ = 0.366mA. ⇒ IC4=0.035mA (find using trial and error method). Explanation: The need for high output resistance current source can be seen because the common mode gain of the differential amplifier can only be reduced by using high resistance current sources. 9. Which current source exhibits a very high output resistance? Explanation: The output resistance of Wilson current mirror is substantially greater than ≅(β× Output resistance)/2 than Simple or Widlar current source. 10. What will be the overall gain in Darlington circuit, if the individual transistor gain is 200? Explanation: Higher value of input resistance can be obtained by using Darlington pair in place of transistor. 12. What is the drawback in using Darlington pair in differential amplifier? Explanation: Due to cascaded stage, Darlington differential amplifier offers higher offset voltage which is two times larger than ordinary two transistor used in differential amplifier. 13. Determine the amount of shift happens in level shifter? 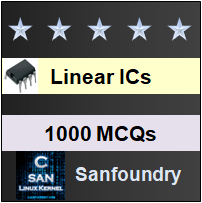 To practice all areas of Linear Integrated Circuit for Freshers, here is complete set of 1000+ Multiple Choice Questions and Answers.